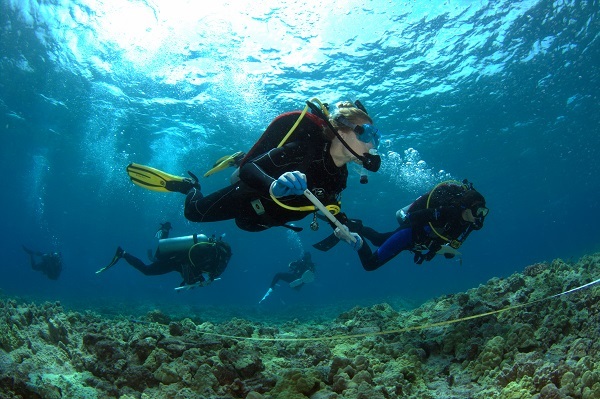 Marine Science is a well-rounded and multi-disciplinary program which has been carefully designed to take full advantage of the unique variety of marine environments available for study around the island of Hawaiʻi. Introductory lecture and laboratory courses in general oceanography and marine biology are followed by intermediate-level courses in marine ecology and evolution, marine methods, and statistical applications in marine science. The most advanced level of the degree programs is composed of specialized courses in geological, chemical, physical, and biological oceanography and electives. The programs culminate in a capstone sequence, allowing students to focus on independent projects involving research or applied internships. We will be an international leader in marine science education and research. Our kuleana (responsibility and privilege) is to provide student-focused, transformative, authentic science experiences, drawing from the unique natural and cultural environment of Hawai‘i. Our graduates will be broadly equipped to become innovative members of the global workforce, successful life-long learners, and engaged stewards of the marine environment. Faculty, staff, and students will collaborate and draw upon each other’s strengths and diversity to achieve our shared vision of student success. The marine science program at UH Hilo inspires and enlightens all learners about the ocean through interactive hands-on learning, research involvement, and community outreach centered on the natural and cultural environment of Hawai‘i Island. This is supported by a broad background in the marine sciences, including fundamental knowledge of biology, chemistry, physics, geology, and mathematics. Students may choose to graduate under the General Education Basic, Area, and Integrative requirements and graduation requirements in force at the time they entered the UH System, when they entered UH Hilo, or when they graduate, provided there is no break in enrollment. The new GE basic, core and integrative requirements and lists of certified courses are posted on the General Education website. 9 credits are required at the 300- or 400-level for graduation with a B.S. degree in Marine Science. To earn a Bachelor of Arts degree in Marine Science, students must fulfill the requirements for the major and meet all of the University’s other baccalaureate degree requirements. - (2019-2020 Tuition) Resident: $306 per credit hour. $3,672 for full time. Non-resident: $846 per credit hour. $10,152 for full time.